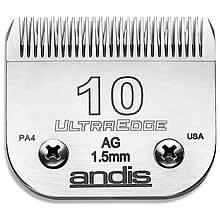 Andis #10 AG Ultra Edge Clipper Blade - Leaves Hair 1/16"
The #10 blade is popular blade for use for general and underbody use on a wide variety of dog breeds and is often selected when a reasonably close and or smooth finish is required. Most professional dog groomers will have this blade and probable use it the most within their day-to-day work. The #10 blade is a frequently selected blade for use on many cat breeds. A short but safe blades. Can often be used for matted cats coats, although in extremely bad cases a size #40 may have to be used. A good blade use when going with the grain of the coat on the faces or light coloured Poodles, which are easily irritated. Used for the under belly work and also on the ears of terriers. Often selected as the blade to use when stripping off coats which have mats that are to close to the skin to permit the use of other blades. Universally used for bodywork on the Schnauzer. This blade is especially recommended for use on necks, ears, and the throat of both Cocker, Fox, Irish and Welsh Terriers, ear tips of the West Highland White Terrier, necks and ears of the Lakeland and ears of the Airedale, Bedington, Cairn Yorkshire Terrier. 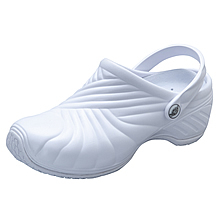 Ideal for the face, feet and base of the tail of Poodles. Use for the ears and throat of Scottish and Sealyham Terriers, and the ears of the Silky Terrier. Use also for the tops of ears on both the English and Irish Setter. Affenpinscher/Afghan/Airedale/Australian Terrier/Bedlington Terrier/Bichon Fries/Border Terrier/Bonvier des Flandres/Briard/Brittany Spaniel/Brussels Griffon/Cairn Terrier/Chow Chow/Clumber Spaniel/Cocker Spaniel/Dandie Dinmont Terrier/English Cocker Spaniel/English Setter/English Toy & Field Spaniels/Gordon & Irish Setters/Irish Terrier/Japanese Toy Spaniel/Keeshond/Kerry Blue/Terrier/Lhasa Apso Maltese/Norwich Terrier/Old English Sheepdog/Otterhound/Pekingese/Pomeranian/All types of various Poodle clips/Puli/The Schnauzers - Giant/Standard/Miniature/Scottish & Sealyham Terrier/Shih Tzu/Silky & Sky Terriers/Sussex & Welsh Springer Spaniels/Welsh, West Highland, White and Wire Fox Terriers, and finally the Yorkshire Terrier - to name but a few!